I want to thank everyone for their patience. I have been called away to deal with family issues more than usual this year, and I apologize that I have once again gotten off-track. Barring any further complications, the current topic of color oddities will return tomorrow. Up until this one was found, there was no evidence that dogs had a similar mutation. The puppy was said to have been found on the streets of Russia, but he disappeared before he could be tested. A photo of him can be found here. I wish I knew more, but that is all the information I have. Perhaps there are more like him somewhere in Russia. It would be a shame to lose the color now that it has occurred. I know I promised the “really strange” horse, but I think I will just have to call this Mystery Horse Week because I have a few more odd horses to share before I get to the one I intended. 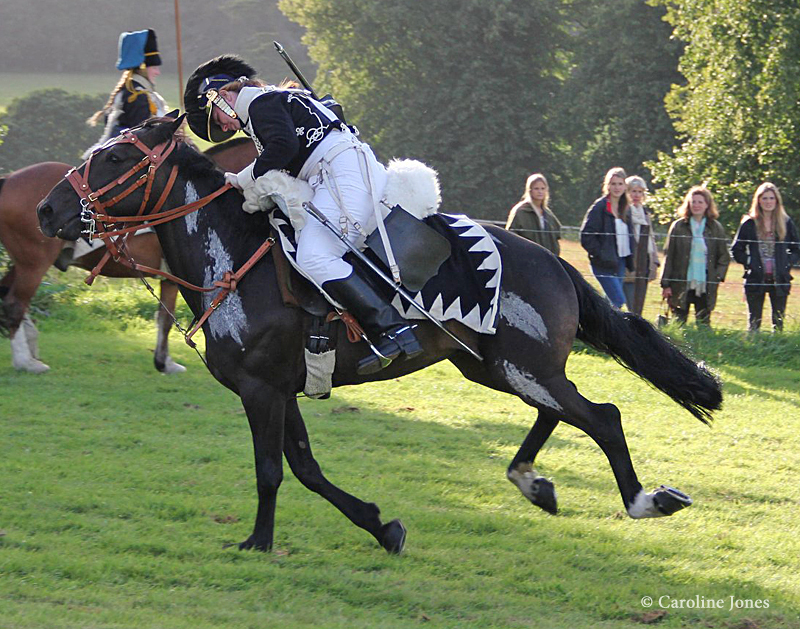 My friend Caroline Jones sent these images from a Napoleonic re-enactment. 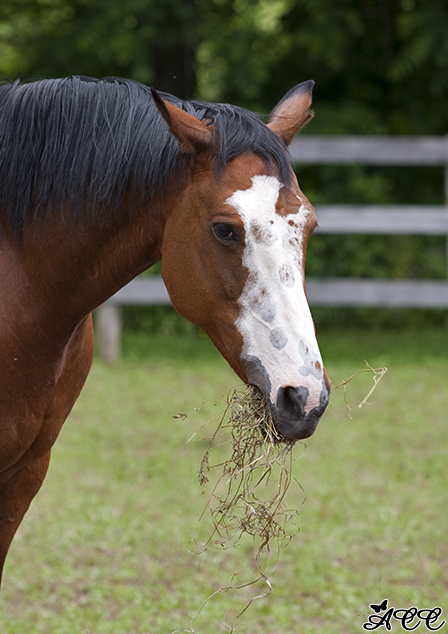 The horse has odd streaks of white hairs on both sides of his body. It looks almost as if someone smeared white ointment on random parts of his body! In some ways the white areas remind me of some of the white striped horses, like the part-Arabian DA Remote Control. 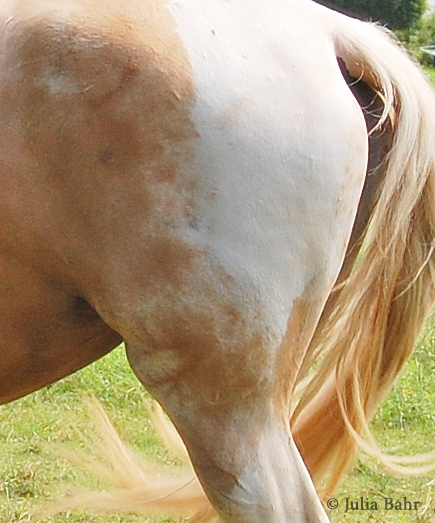 The marks on this horse are broader – more like smears than stripes – and less opaque, and they are present on both sides. 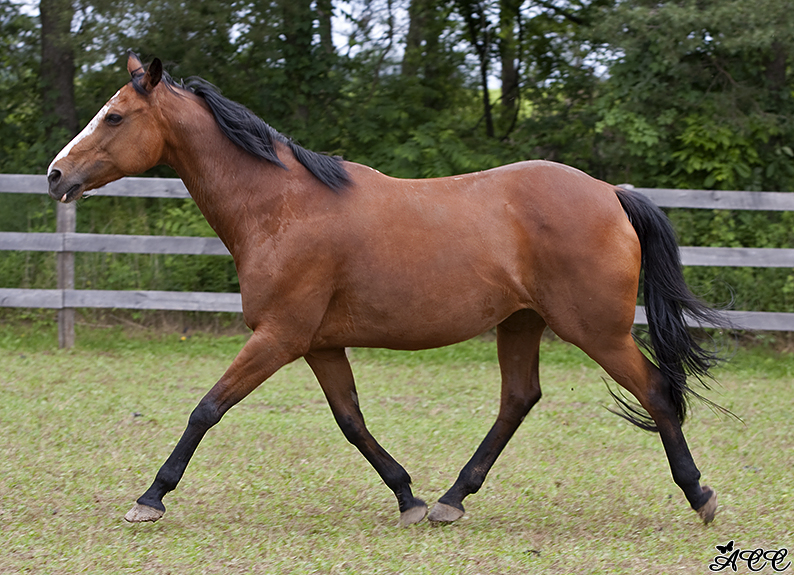 To date most of horses with a pattern like the one linked have had stripes only, or at least primarily, on one side of the body. 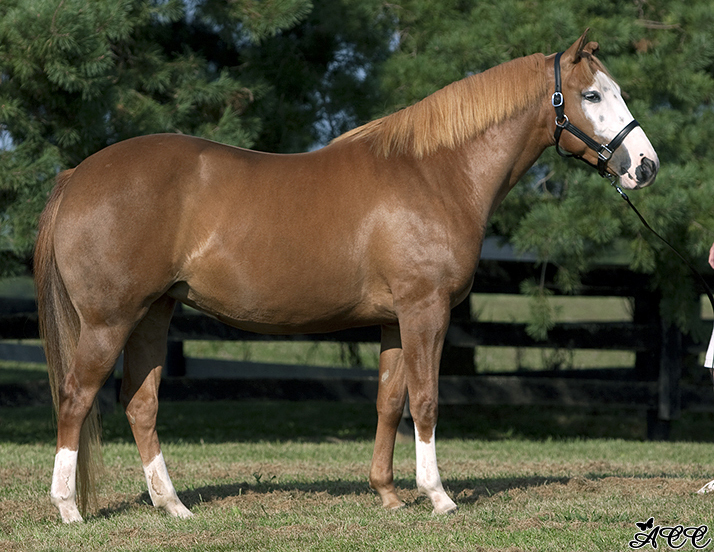 If this is not environmental (ie., if it was not caused by something smeared on the horse), and I had to guess, I would suspect that this is another type of somatic mutation, much like the white striping is thought to be. 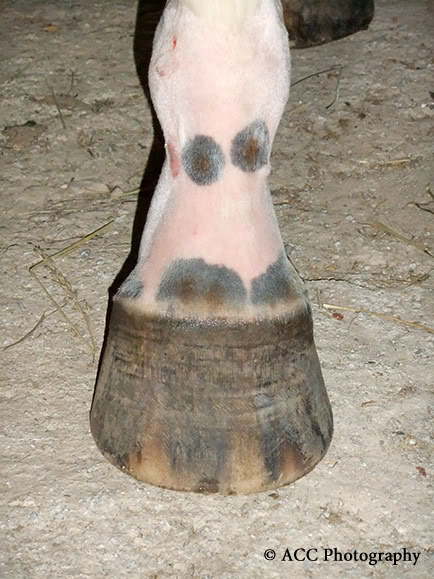 I do believe I have seen at least one other horse with this kind of marking, but I cannot remember where. Certainly if any of the readers has a lead on more horses that look like this, please pass it along. 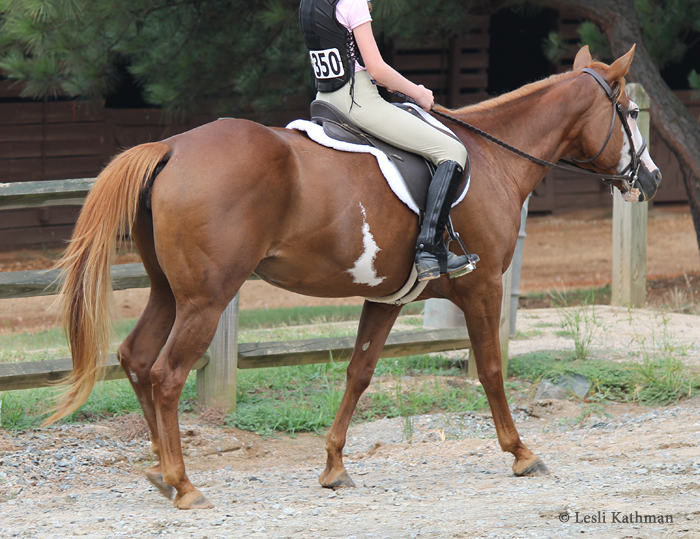 If there is one thing this blog has taught me, it is that if there is one horse with some odd type of pattern, there are probably similar ones somewhere. And that’s what I’ll post for tomorrow’s Mystery Colored Horse. Earlier this year a very odd Saddlebred surfaced, and appeared in this post. Others like her have since surfaced, but just recently someone shared photos of a horse with a documented background, including foal pictures. That should give me enough time to finish assembling the images for the really unusual horse. Edited: I substituted the word “mystery” for “strange”. While I love anything strange, I realized that the kind folks who sent in pictures of their horses might prefer them to be called something other than “strange”! 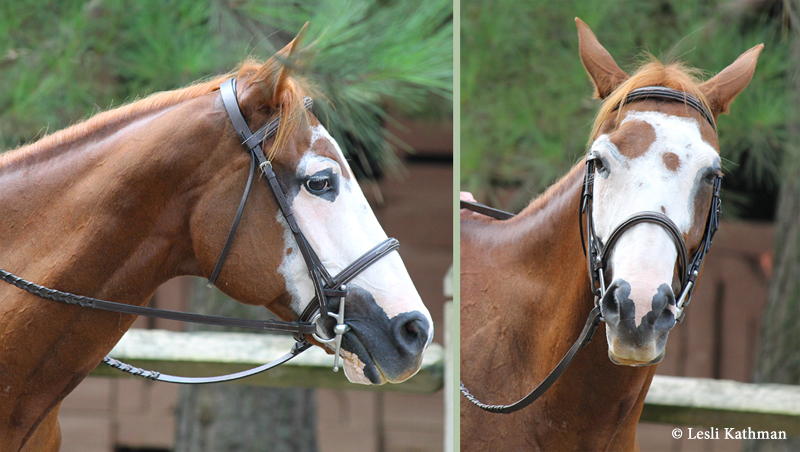 In yesterday’s post, I included Audrey Crosby McLellan’s mare, AC’s Painted Lace. The belton spots are pretty obvious on her face, and I wondered if there were similar spots on her white legs. Audrey was kind enough to provide pictures that show them very well. These first two images are with the lower legs clipped, so they show the spots very clearly. 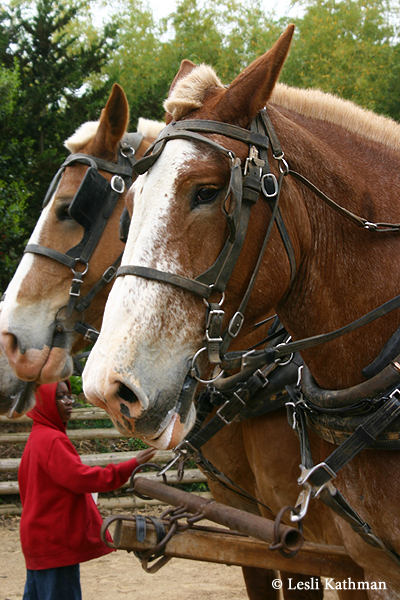 Like the spots on the faces of the previous horses, they are very round and have the same kind of halo effect where the underlying dark skin is wider than the colored hair. 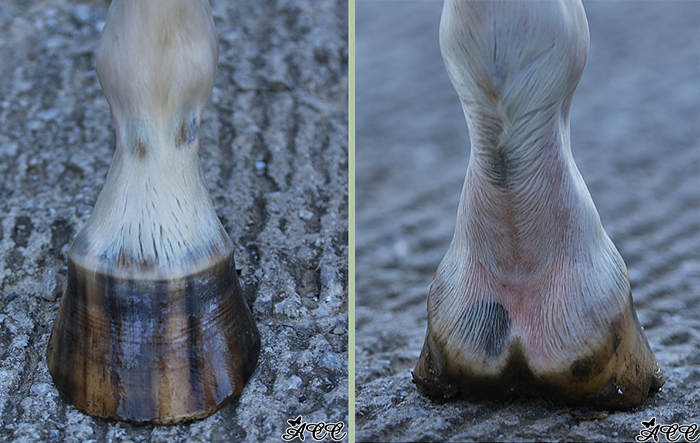 Those images show the markings very clearly, and these are good shots of wet feet to show what is going on with the hooves. 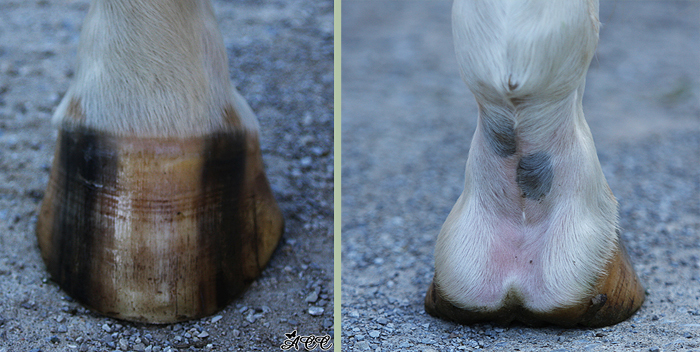 These pictures show how the color is concentrating down around the hoof. 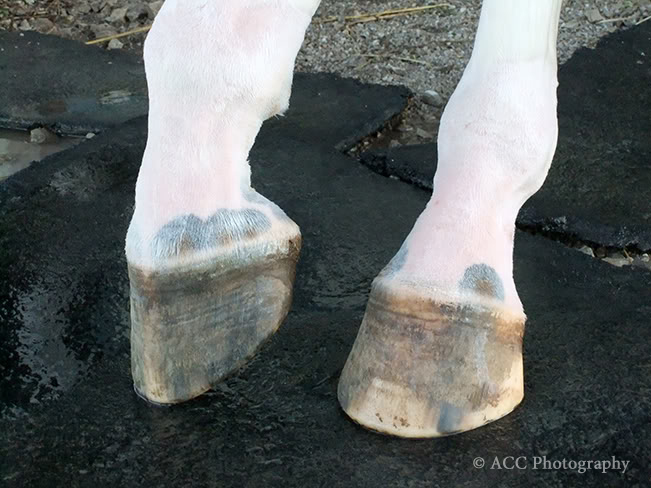 This kind of density in spotting is often seen in tobianos, where the cat-tracks cluster around the hoof. This gives some tobianos surprisingly dark hooves. It is also seen in some belton dogs. They have heavier spotting on the legs (and face), but it increases still more at the toes. 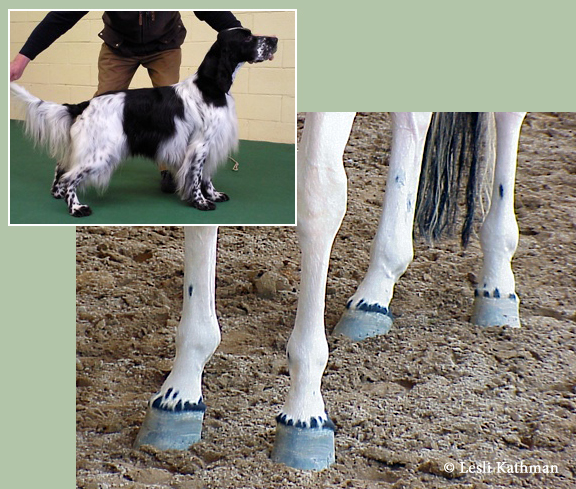 Here is a tobiano with that kind of spot concentration, and an inset image of an English Setter with the black-toed belton look. 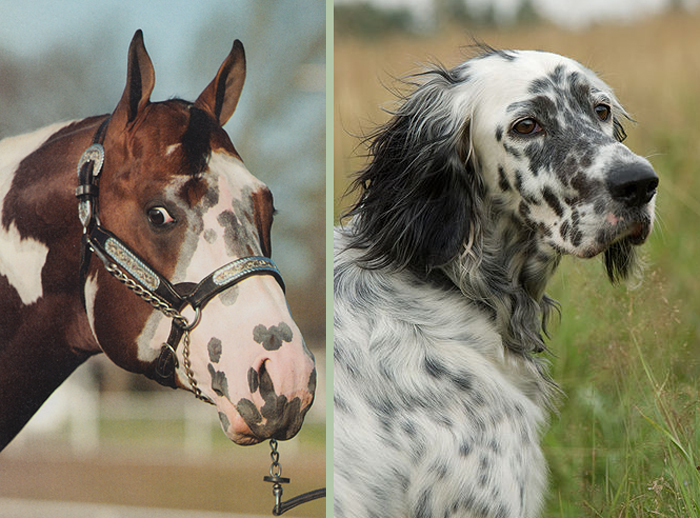 I have no idea if the actual mechanism behind belton dogs (T, or Ticking) is even similar to these kinds of spots on horses, but the visual similarities are striking. I would also add that posting unusual horses to the blog is a lot of fun, because it often results in readers sending in images of their own horses, or horses they have encountered. Just recently, someone sent a horse that is truly strange – and it takes a lot for me to call something strange! I am going to use the leg spotting as a jumping-off point to talk a little about cat-tracks, and then move on to my strange example. So stay tuned for some cool stuff! 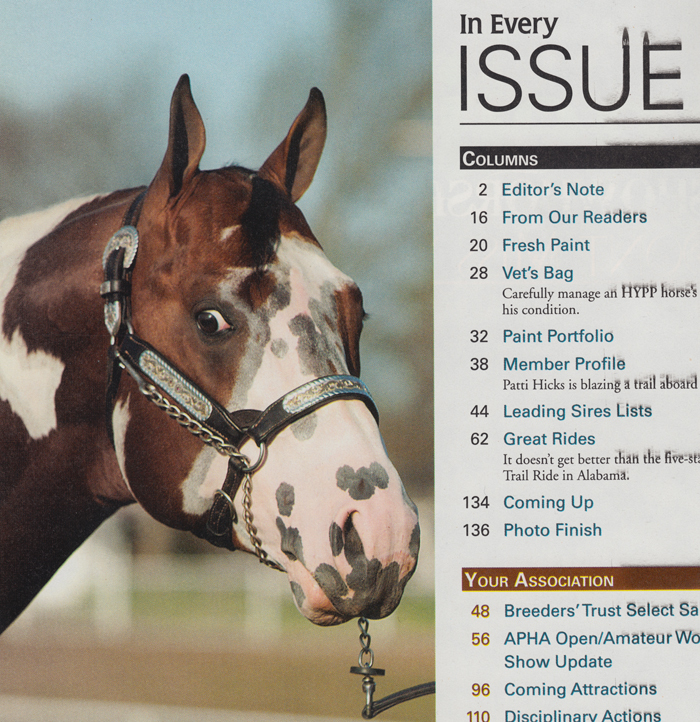 The above image of a belton patterned face is from the contents page of the most recent Paint Horse Journal. I didn’t notice the title until I scanned it so I could add it to my research files. It certainly does seem that lately there is a horse with this type of patterning “in every issue”! The horse pictured is the Paint stallion Hes Stylin. He is a good example of the type of belton ticking that seems to be linked with the presence of the frame pattern. Like the pattern in some dogs, this type of dark ticking concentrates more heavily on the face, where the spots are more numerous and generally larger than on the body. 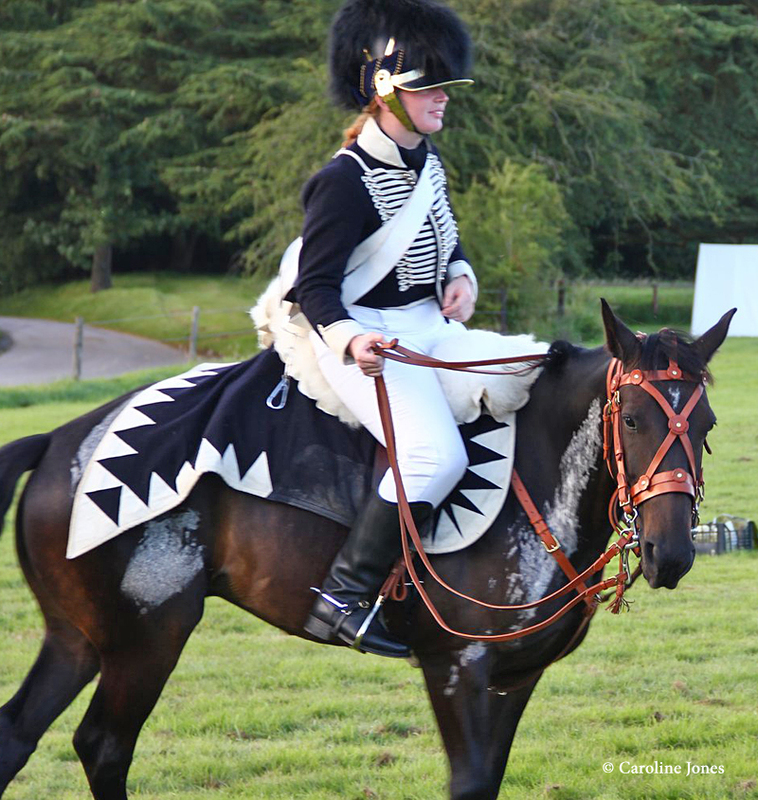 Since making the initial few posts about what I called belton patterning (for lack of a better term, since “ticking” already means white hairs in the coat), many people have sent pictures and links to horses with these kinds of markings. I have also begun noticing the less dramatic versions that I had previously overlooked. The more I see of ticked horses, the more I believe that this particular type is probably linked to frame. That doesn’t explain a horse like Vision Morinda, or the more heavily cat-tracked tobianos, so I suspect there is more than one cause of dark spots on markings or patterns. The frame overos with belton patterning, though, seem to have a pretty consistent look. The spots are very round, and often have more colored skin than colored hair, which gives many of them a ghosted or haloed appearance. This type of effect is noticeable on the cluster of spots close to Hes Stylin’s left eye. The white patterning on the body does not really show a lot of these round spots, though most have had some. I’ll return to Gump, the first horse I posted, to show both sides of his pattern. The round spots on his face contrast quite markedly with the ragged nature of his pattern. The link to Hes Stylin (above) shows a full-body picture, and he has the same kind of contrast between the torn outline of his pattern and the regularity of the spots. I apologize that I don’t have a better photo of Gump’s left side. 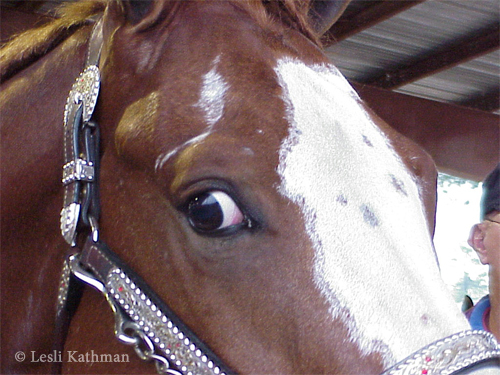 I try to get conformation shots of both sides on patterned horses, but sometimes the opportunity never presents itself. It’s not a flattering picture, but that left shot does show how much clear white there is on the body pattern relative the the spotting on the face. Gump does have some belton spots on his lower legs, though they are not as pronounced as on his face. Most dogs that have this type of belton pattern have bolder spotting on the lower legs as well as the face. 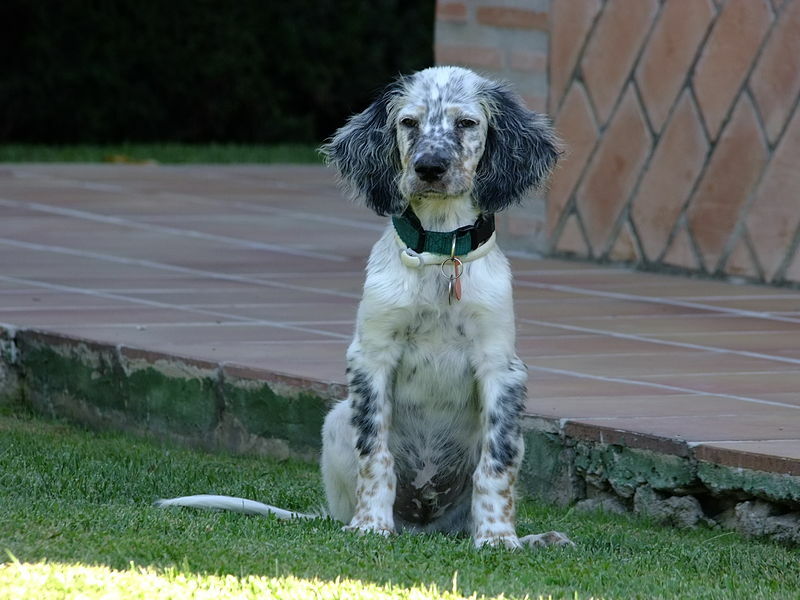 The image of this English Setter puppy (also courtesy of Wikimedia Commons) illustrates that effect, though the underlying black-and-tan pattern makes her feet look paler because the base color there is tan. Because frame overos do not typically have a lot of white on the lower legs, it is hard to know if the spots would concentrate there or not. In fact, many of the examples I have encountered or have been sent have no white on the legs at all. 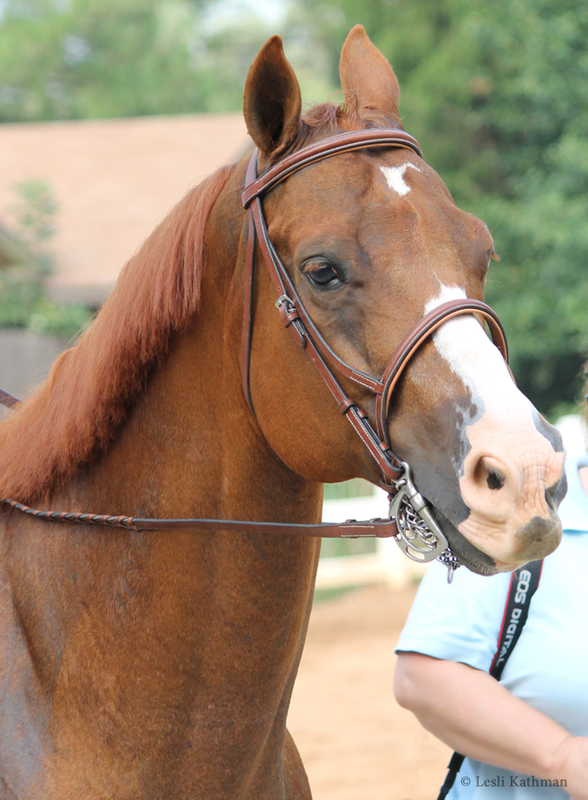 Here is a mare I photographed at a fun show last fall. A different photo of her appears in the book to illustrate the frame pattern in what is probably its pure form. Her legs are all dark, but here is her face. The spots are not nearly as pronounced on her as on Gump and Hes Stylin, but that seems to be true of most of the chestnuts with these types of spots. 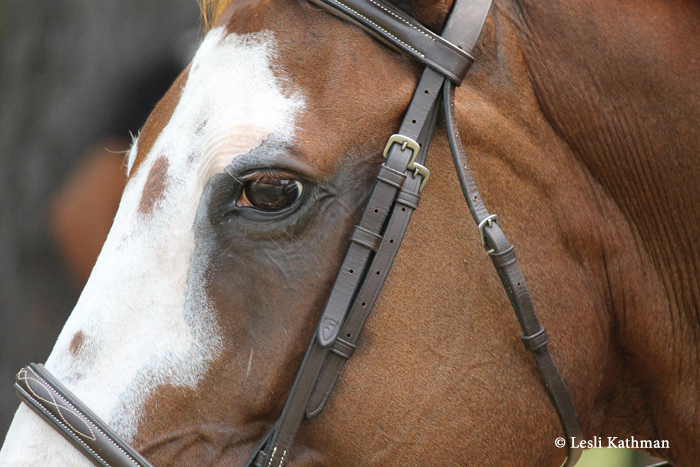 What is interesting is that this mare also has what looks like a large occluding spot above her right eye. 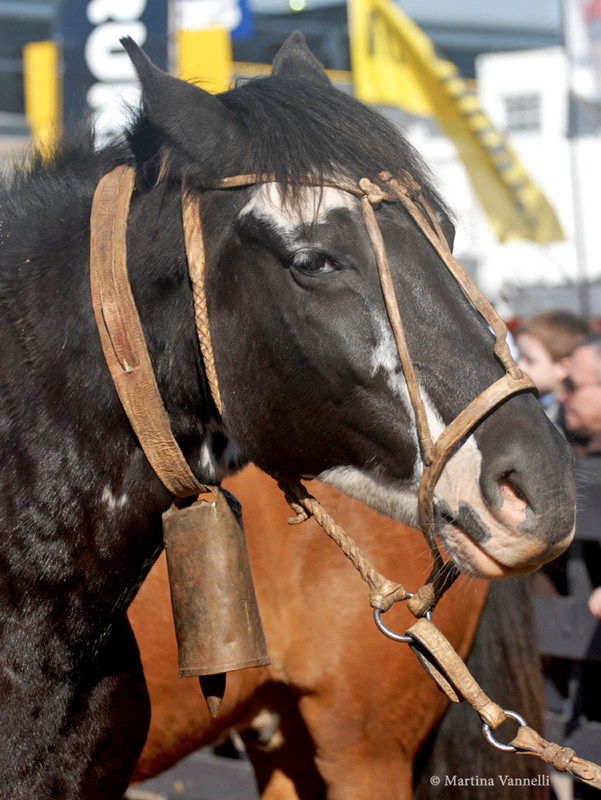 For that matter, it is possible to think of the patch over her eye, and the one across her muzzle, as occluding spots. If you look at Hes Stylin up at the top of the post, he has a similar set of patches above his eye, too. 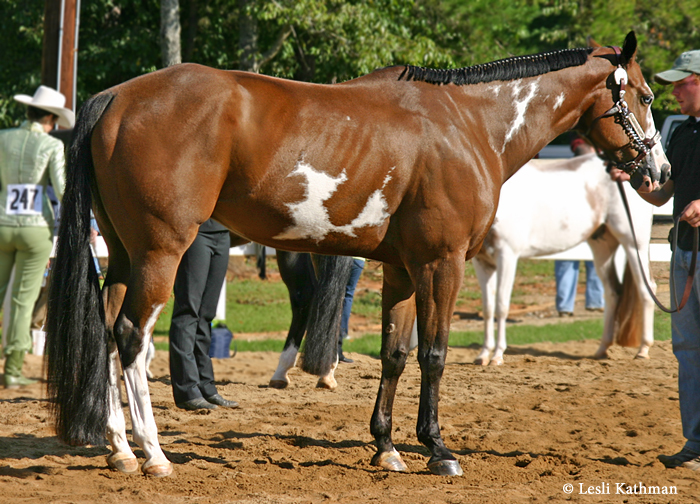 A similar spot is present on this Paint cross mare, Hechzeba, shared by Audrey Crosby McLellan of ACC Photography. She is tested positive for frame, but has no body white (or leg white) to show any further spotting. 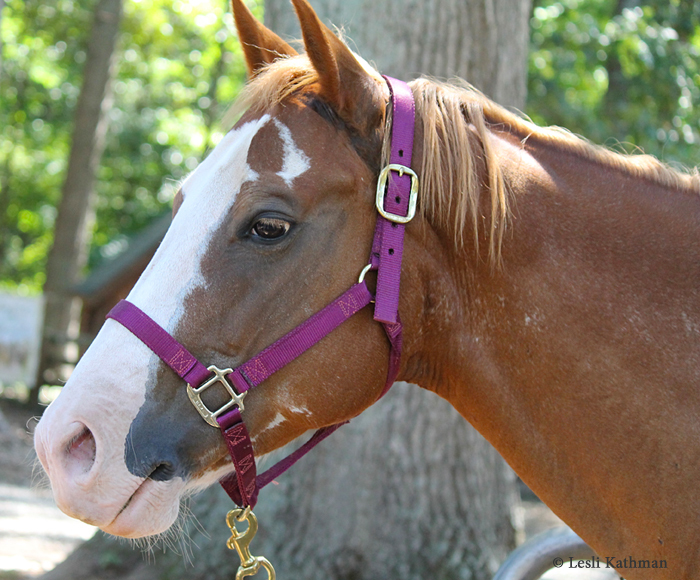 Audrey also sent a link to pictures of her own mare, AC’s Painted Lace, who was also tested to carry the frame pattern. 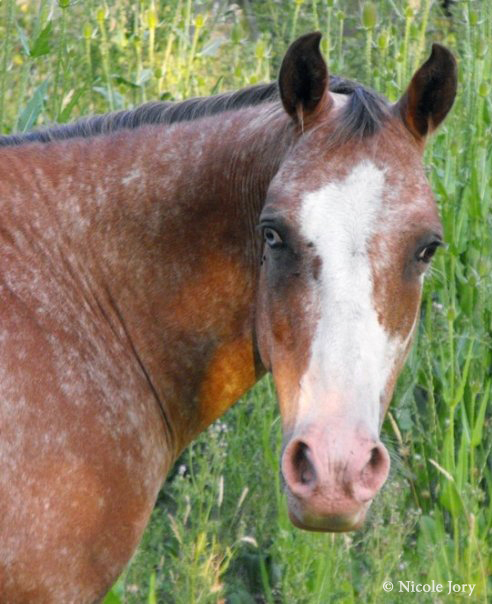 Notice how she has a patch over the eye and on her nose that are quite similar to the earlier mare. In photos it looks like Lacey has some spotting inside her socks, but even her face spotting is more subdued than some of the others. 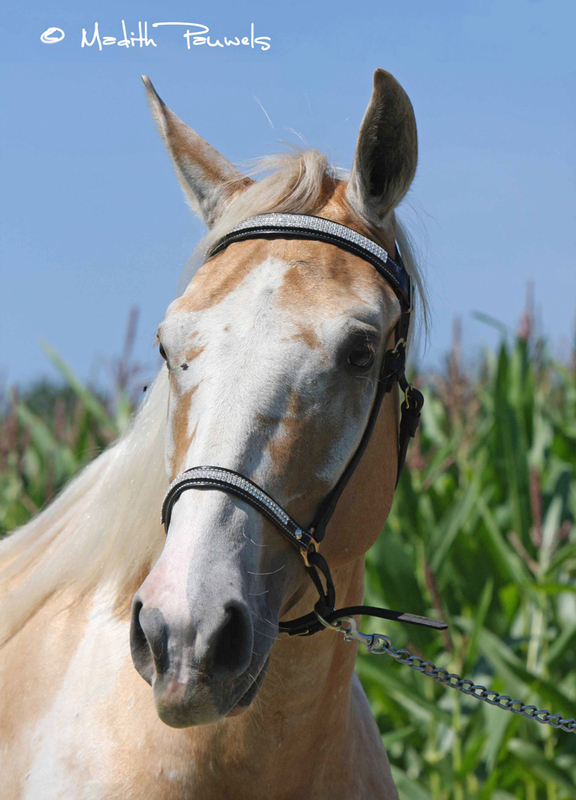 It may be that is due to other white patterning, since some white patterns (like some forms of sabino) are known to amplify the white on the horse at the expense of colored areas. It also might be that this particular kind of spotting is just concentrated on the face. Until there are more examples with leg white, it is hard to know for sure. And even then, it is hard to know if the factor that put the white on the legs (where it is usually missing on frames) might not also erase the spots there. That may be what happened with Hes Stylin, since he has what appear to be unspotted legs. One of the most interesting aspects of white patterns, at least for an artist, is whether or not they overlap one another or interact with each other (and other modifiers). Perhaps because most techniques involve adding – or sometimes removing – layers of color, it is only natural that artists tend to assume a layering relationship. What is appears to be true is that patterns typically have a complex set of interactions. 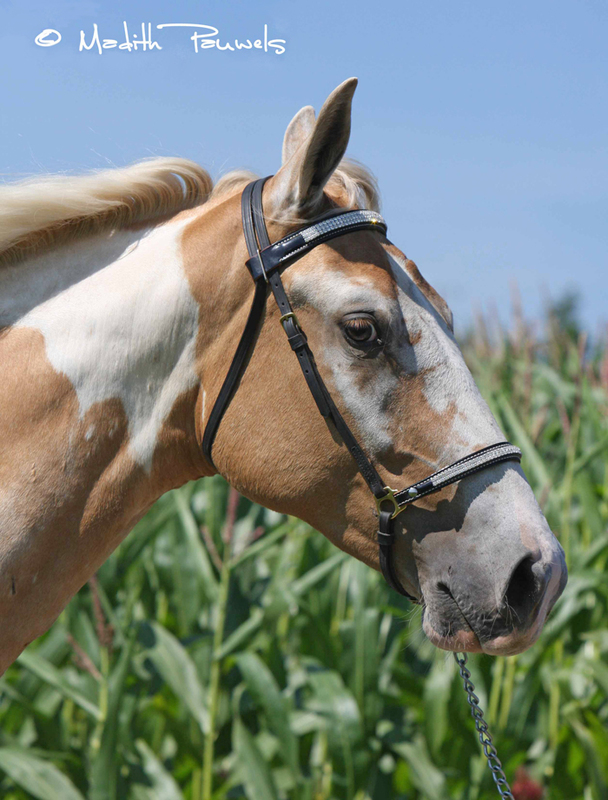 For example, there is good reason to believe that some of the sabino patterns (like the one seen on the horse above) interact with whatever mechanism produces ordinary white markings by amplifying the white in those areas. Meanwhile both the markings and the sabino patterns appear to interact with the base color. Simple layering seems to be far less common. That is one reason why some forms of snowflaking (like the one in this post from a few days ago) are so interesting, because it appears that some types do overlap existing patterns. I suspect that overlapping white spots are behind the really unusual “jigsaw” leopard Appaloosa mare Dazzling Vision Spot. More common, though, are overlapping dark spots on the face. In dogs these are sometimes called Blenheim spots, for the red and white pattern in Cavalier King Charles Spaniels where the markings are considered desirable. 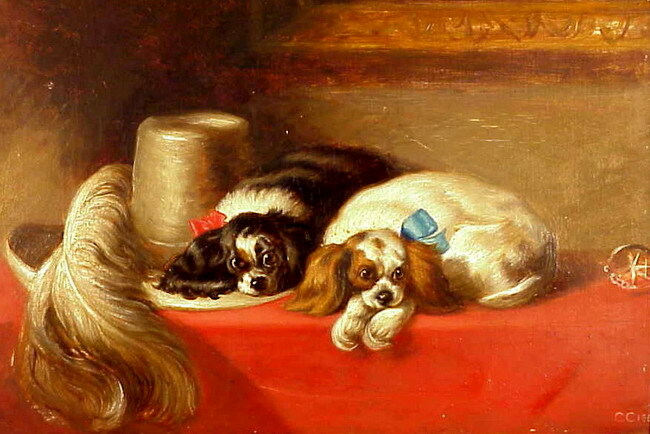 One is visible inside the blaze of the red and white spaniel in this nineteenth-century copy of a Landseer painting. The horse at the top of the post has a similar spot in the top corner of his blaze. 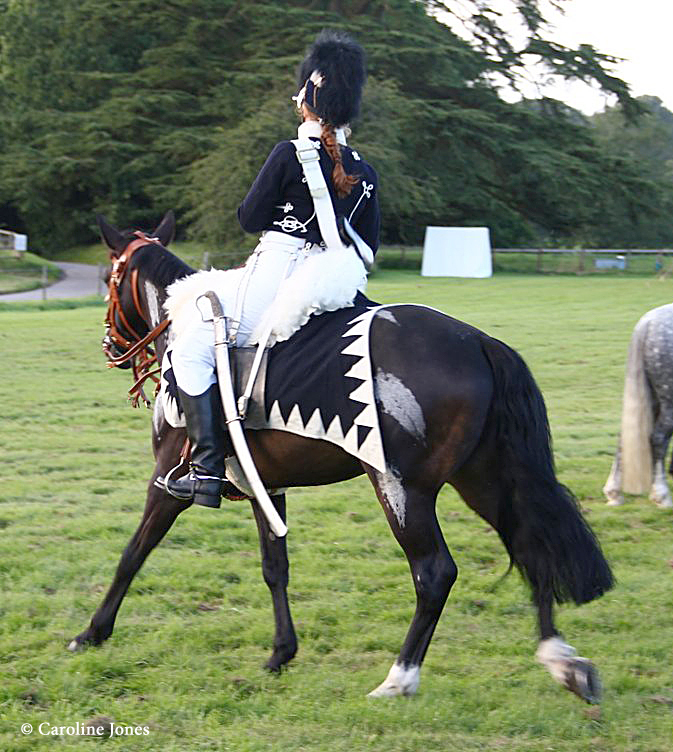 In horses these inset spots more often appear offset rather than centered on the blaze. This can give the the top of the blaze a scalloped look. Since the one in the picture is set a little further inside, it bisects the blaze so that there appears to be an irregular section of disconnected white. That white is probably not a separate marking, but rather the remainder of the blaze that the overlapping colored spot did not cover. The tinted areas in this photo show how this works. I have shaded this Paint Horse’s broad blaze blue, and the imagined overlapping spot bright pink. The area where the colored spot overlaps the blaze is purple. On this horse, the disconnected white this leaves is much smaller. I have called these colored patches occluding spots, since they cover (occlude) part of the white face markings. If the spot is large enough, the result is what is often called a badger face. 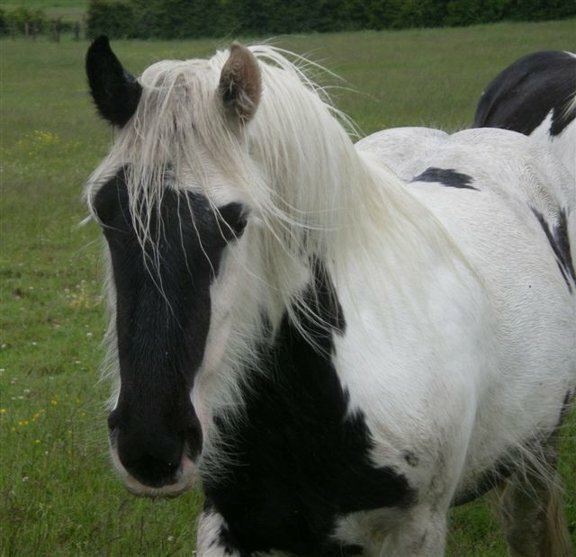 Some badger-faced horses have spots large enough that the only thing left of the blaze are small, detached segments of white. 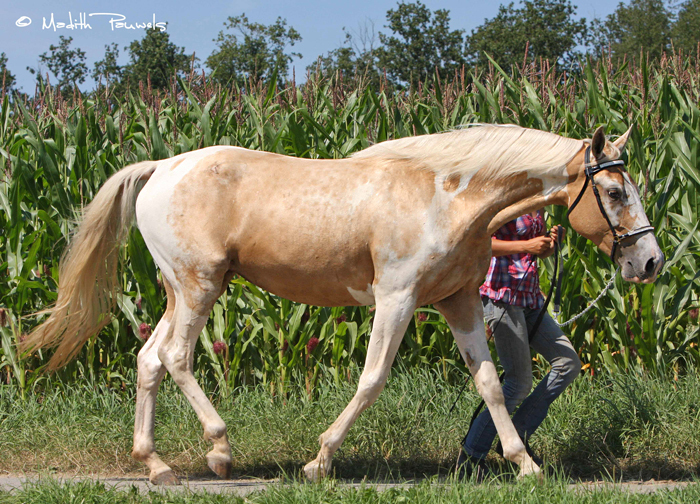 Here are some good examples of that: Akhal-Teke1, Akhal-Teke2, Paint Horse, Thoroughbred and another Paint. 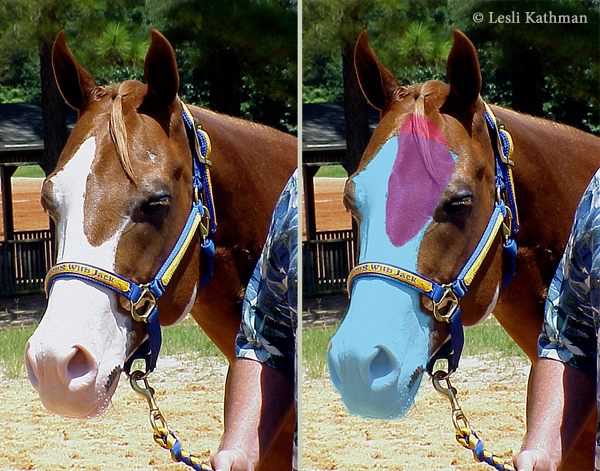 The separate nature of occluding spots is even more apparent when they occur when white patterning has completely removed the color from the face: Paint, Gypsy Horse, and another Paint. I suspect that the horses pictured so far have something similar going on with their face markings, with just slight variations in scale and placement. I do not believe every dark spot inside a face marking is an occluding spot (or minimized badger-face marking, if you prefer). 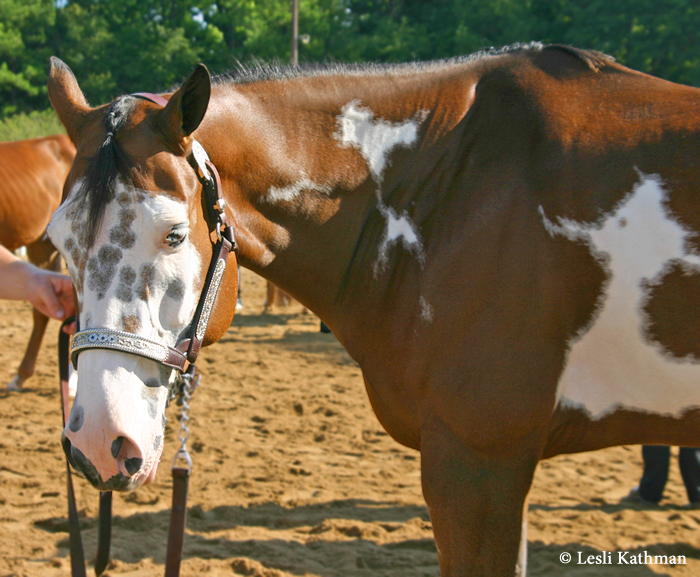 This guy is perhaps a good horse to look at what are probably two different things altering his face marking. The most obvious change to his blaze is what looks like two or more occluding spots breaking it into two pieces. If you look further down his face, though, his blaze begins to break apart into round spots right behind his nostril. Because the scale and character are rather different, it is my suspicion that there are different causes for the two changes. What is happening close to his nose looks a bit like the way sabino degrades the edges of markings. 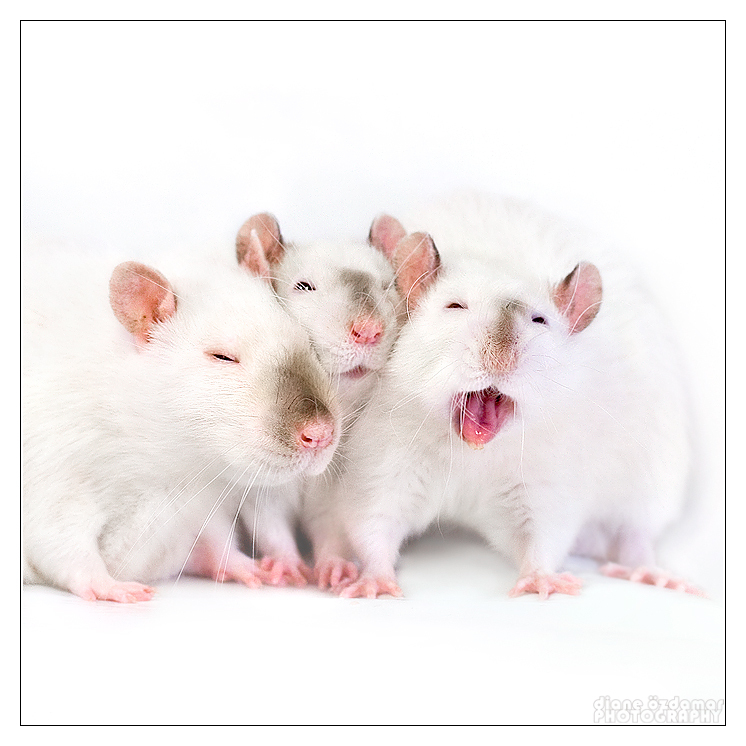 This Belgian has a more roany version of what is probably the same type of thing. Here is another horse that has what I think are two different things going on as well. Along the upper edge of her blaze a mid-sized occluding spot has cut off most (but not all) of the corner of her white marking. 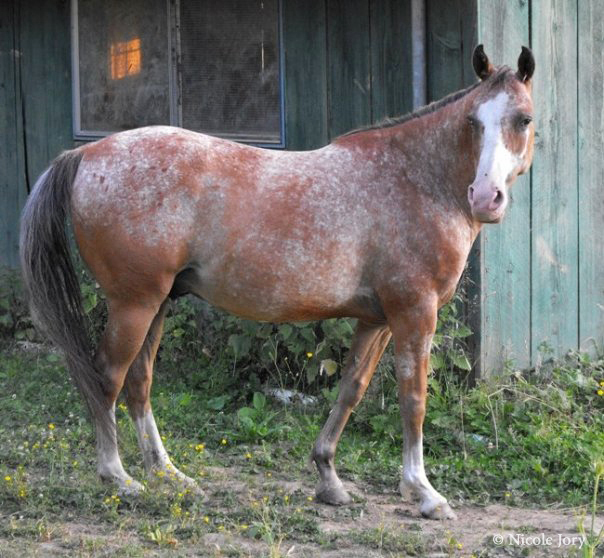 Nicole Jory shared a photo of her appaloosa pony, Jack, in the comments section of the post on snowflake patterns. 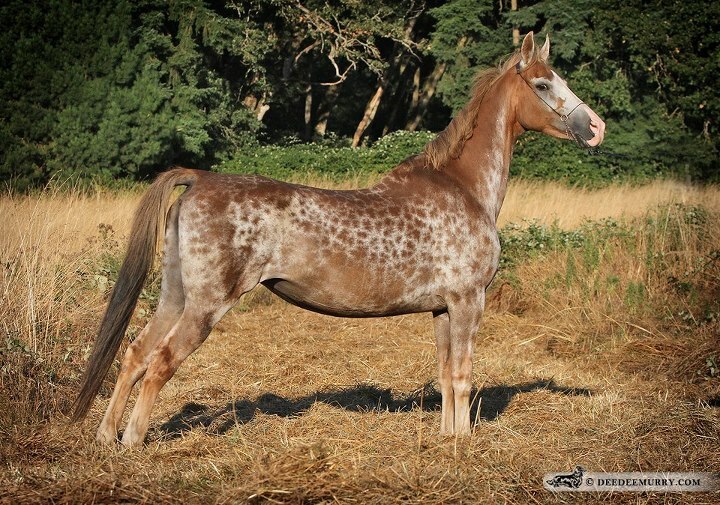 I wanted to share him here because he is also a great example of color shifting on a bay appaloosa. His stockings hide it on the other three legs, but if you look closely at the left foreleg you can see the odd pewter color where the leg would normally be black. For some reason color shifting seems more common on black appaloosas than on bays, so I was happy to find such a good example. He also has what I call an “occluding spot” over what would probably have been a bald face. Nicole suspected he was carrying a splash pattern, and I would tend to agree. Blue eyes and this type of face marking are very common in Appaloosas that trace back to Bright Eyes Brother, who is believed to have carried classic splash (SW1). Jack will make a good jumping off point for the next set of posts about those occluding spots, which I hope to post later over the weekend.